Opening this weekend (November 5, 2004), The Incredibles is a film about a family of superheroes forced to set aside their special powers and live normal, quiet suburban life. Hardest hit is Mr. Incredible, who wrestles with being a family man and longs for the glory days of upholding law and order. After indavertently uncovering a diabolical plan, however, the family of five must bring together their respective strengths to save the day. 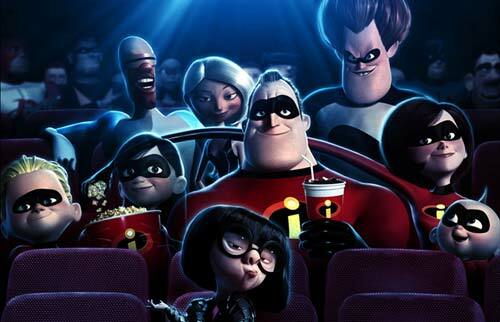 We've been provided with some images from this action-packed animated adventure about superheroes. Take a look! And I thought it would be a good way to start the images we have for you! Bob Parr and his "big" boss at the insurance company. Bob is having fun waiting in traffic... not. In a stitch or in need of one? Frozone can ski year round. How cool is that!? Even superheroes sometimes take the elevator. Violet and Dash. More than ordinary kids. Mr. Incredible and Frozone are always ready for action!